It has been warm around here the past few days, so warm in fact I spent most of Saturday outside cleaning my car. I didn't even need a jacket until today, and that's when I found it--- my lonely bubble mailer. It was in my coat pocket for about 2 or 3 days just waiting for me to rip into it. 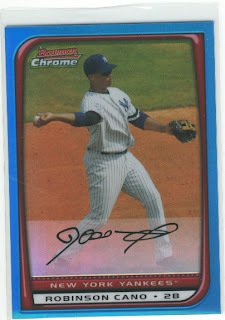 The seller also included a free 2008 Bowman Chrome Cano for free. While I love free stuff, and always appreciate a seller doing something like that I had the card already. That Lind card is AMAZING! He is really impressive this season with the Jays. Everyone is a Lind fan now. 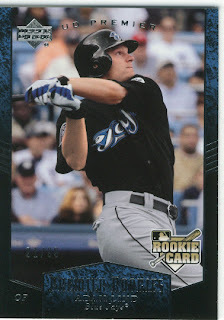 Yes that Lind card is quite impressive. More impressive than Robinson Cano - the jury is still out on him. It's still hard for me to see Soriano running around in a different uniform. He deserved a World Series ring in 2001. Jeffrey's right, PNC is the best ballpark in baseball. It's definitely worth a weekend trip from NYC to see. A trip to PNC when the Cards are in town should be fun.